I can’t believe I’m blogging about sewing instead of camping, because we did go camping and it was not a disaster! Yeah! The curse has been broken! I’ll put up photos later, but right now I’m going to share some of the sweet baby crafting I’ve been doing. This fall seems to be a very busy time for babies among my friends and cousins. I’ve been churning out cute little bibs left and right and have finished a couple little projects in too much haste to photograph them, but I did manage to snap these before they were out the door. This is a flannel-lined cotton jacket and booties based on patterns in the One Yard Wonders book. I’ve blogged about patterns from this book before; it’s so great. It’s become my go-to for quick and cute gift ideas. This jacket came together really quickly and could easily be made in fabrics for a boy or a girl. It’s not grouped with the booties in the book but I thought they made natural companions for a gift. These are for the baby girl expected by one of my cousins. This little diaper kit was inspired by a Pinterest pin. 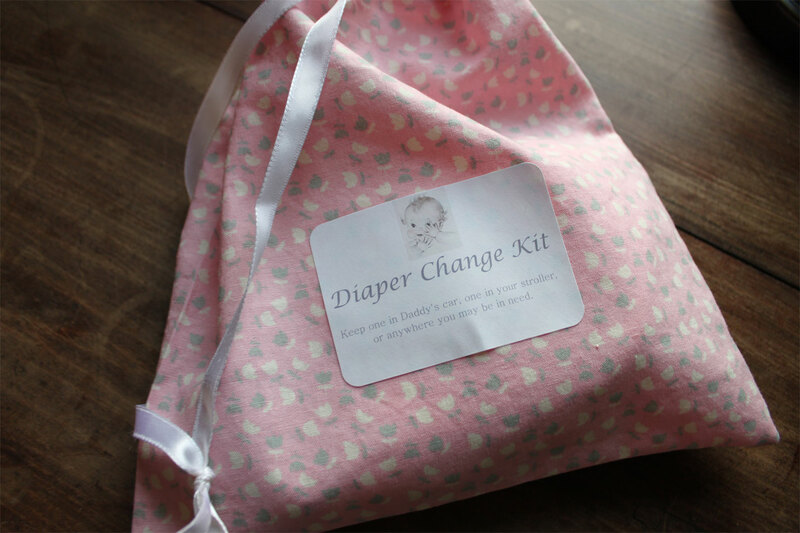 I have always kept little drawstring bags with diaper change supplies tucked in various spots I might need them, and have even given new mothers drawstring bags before with a suggestion to use them as such, but I had not thought of packaging them as “kit” to make a gift. I bought a pack of newborn diapers (and am now, creepily, being sent baby coupons by Target), some individual wipes packs, a box of disposable changing pads and some individually-wrapped hand-sanitizing wipes. To make up the kits I just stick one or two of each item in a handmade drawstring bag and stick on a little printed label. I’ve now used these bags as add-ons to several baby gifts recently. I feel like they’d make a particularly nice gift to a second-time mother who may be over the hassle of a big diaper bag but who still needs to have all the diaper-change goods at the ready.